love the chairs? where did they come from? those chairs are scrumptious and really not like any i've been able to find! Exposed treads...also done with engineered walnut flooring? - Is it possible to have exposed treads with engineered wood flooring? Or are the treads hardwood, stained to match the floors? Thanks! Hi Dave, these stairs are 3/4" walnut with a expresso stain, not engineered. However your idea would work if you used engineered hard wood,. the inverted cove would cover the edge, but why? Engineered wood is more expensive than solid, so you are not saving the client anything and making the job harder to complete. The "edge" or the inverted cove, as we refer to it, is hand sanded and stained on sight. Please feel free to call me anytime if you have questions regarding FloorWerks projects. Can you tell me what handrail was used in this staircase? Thanks. Thank you for the quick response. That is helpful. Also, do you know where this handrail was purchased and the style/name of it? I like the look of the side profile with the groove running along the side. 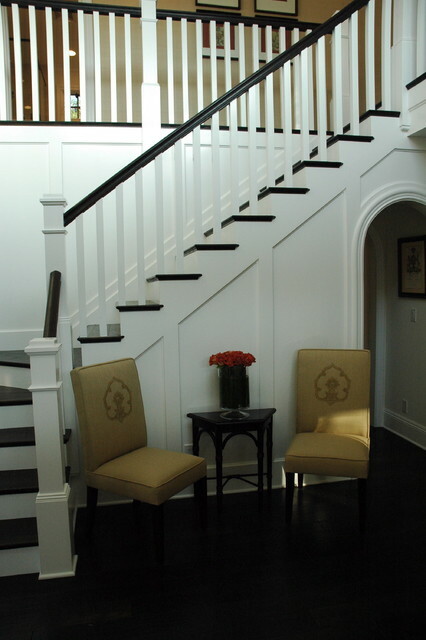 Stair risers - Wondering if you have a recommendation for a white paint color to paint our stair risers? Thanks,! Dunn Edwards Whisper White always nice. Staircase stain - Can you tell me the stain color used on the staircase railing? Thanks! No stain, the handrails and treads are solid Walnut with a clear finish. Post - What size post are these? the newel posts are 6"x6" and the balusters are 1 1/2"x1 1/2"
Can you give me the details on the flooring? What are your suggestions for lighting a staircase in a newly built house? This house has one large chandelier at entry and sconces on walls upstairs. Here the upholstery recalls burlap but is much more refined. What I love here is the great color selection. The combination of black and white has been done so perfectly here that it works even with the very simple shape of the banister. love this newel - exactly what I want in style and shape paint top of newel, first bar below newel and bar above base of newel in dark paint Benajmin Moore 1568 - quarry rock ? ?